They come in 6 flavors, Cinnamon Sweets, Graham Crackerz, Marshmallow Oaties, Sweet Wheat, Honey Oaties, and Honey’n Oats. All of them have no trans fat, artificial colors/flavors or preservatives. I got to try a couple of the cereals, and they did not disappoint! Here’s my thoughts on them, and how they live up to the childhood favorite. Honey’n Oats- It has corn, wheat flake and granola clusters, all with just a touch of honey. The flakes were light and crispy, and I looved the granola clusters. It was sweet and crunchy, and was a nice topper on my oatmeal ( I like to have some CRUNCH in my oatmeal!). My only complaint is I wish there were more granola clusters. I only got a few in one serving, and they are my favorite part! Graham Crackerz– It has a bit of a ginger bread cookie flavor and it wasn’t too sweet, and had very nice molasses, cinnamon and nutmeg flavors. Nice and crunchy, it went well with my chocolate pudding, or eaten as is (dry, without milk). 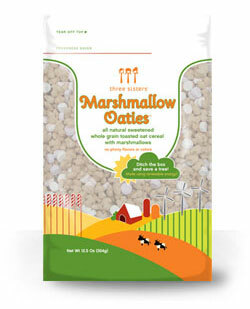 Marshmallow Oaties- This one had sweetened whole grain oat cereal with cute circular marshmallows. The oat pieces were too cute- they were shaped like anchors!- and had a sweet vanilla taste, but not overpowering. They were nice and crunchy, but also puffy and airy in the center. The marshmallow bits dissolved in my mouth but still have a wee bit of a crunch. I like how the serving size is 1 cup as well. Yum! Sweet Wheat- They all had a generous amount of sweet sugary topping 🙂 The biscuits were also thick, with many layers of sweet, crunchy wheat. They were excellent and plumped up nicely in my vanilla soy milk and sliced banana. Deee-lish. Honey Oaties- these are good too! Crunchy and in the shape of tiny circles, or o’s, they were sweet with a nice honey taste. I’m always a fan for honey! Overall, these cereals get 4 stars. My favorites were the Sweet Wheat and Marshmallow Oaties. They would get a higher rating, except that they do contain some refined sugar, and some of them have corn syrup as well. They are also relatively low in fiber, except for the Sweet Wheat variety. I will probably use these as a mix with my higher fiber cereals or breakfast, or if I’m craving something sweet & crunchy 🙂 On the plus side, they don’t have any trans fats, preservatives or artificial ingredients. Graham Crackerz- 3/4 cup is 130 calories, 3 grams of fat, 25 carbohydrates, 1 gram of fiber, and 1 gram of protein. Marshmallow Oaties- 1 cup is 120 calories, 1 gram of fat, 24 carbohydrates,1 gram of fiber, and 2 grams of protein. Honey’n Oats- 3/4 cup is 120 calories, 1.5 grams of fat, 25 carbohydrates, 1 gram of fiber, and 2 gram of protein. Sweet Wheat- 1 cup is 210 calories, 1 gram of fat, 45 carbohydrates, 6 grams of fiber, and 5 grams of protein.